For the last few weeks, it has been a joy to lead weekly art workshops in our local Salvation Army shelter. The shelter is a haven for families, and many of the residents have also found themselves to be in dark places, struggling to find their own identities. Each resident’s story is different, and I hope to get to learn the stories in time. Many of the women here are homeless because they have fled unhealthy relationships, domestic violence. The shelter creates a safe place to land temporarily as these parents begin to rediscover their individual senses of identity. This is where the “Mission and Art” ministry steps in. As we gather together, we share small stories about our lives and get to know one another. We pray, read Scripture and create. We talk about really important things and we laugh about silly things. It is a sacred space for women to gather. So far we have played with mixed media art, acrylics, and watercolor painting. Accept that you are an artist. We were all created in the image of a creative God – we are each inherently creative! Be kind to yourself and others. No criticizing words for your own artwork or for others allowed. Do art for the process. Know that you will create whatever you were meant to create here – and that is enough. There are no mistakes, no mess-ups, no perfection allowed. It is my prayer that through our times of creating art together, the women of this shelter will enjoy moments of celebrating their innate creativity and enjoying one another’s company. May the work be empowering, healing and stepping toward wholeness. If you have been inspired by this post and would like to learn more about the Mission and Art ministry, feel free to contact me at erin@nwumc.org. Be blessed today! I can’t even look today. I don’t know about you, but I can’t even bring myself to look at the newsfeed today. I have seen enough to know that the news cycle is devastating. This morning my sweet husband told me all I needed to know to know that this will be a news cycle filled with heartbreak, pain, theories, hurt, blame, politicizing and brokenness. There will be images of the aftermath, biographies of the deceased. Today’s cycle will be inevitably be followed with posts of division, conspiracy theories, differing political arguments about gun control, violence, mental illness, and more finger pointing. My soul can’t take this today. I wish I could end this post with an explanation about why bad things happen to good people. I wish I could explain why evil exists. I just don’t know the answers, but I do know that we will be okay. We can have hope for the future. We need to hang on to that hope today…and we need to love one another. Who needs to hear a message of hope from you today? 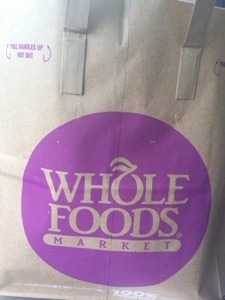 I love Whole Foods grocery stores. There isn’t one near my house, so it’s a rare treat. I love walking the aisles surrounded by vibrant colors and aromas of natural, organic, healthy foods, most of which are foreign to me. Chia, flax, collard, gluten-free, vegan super foods with brands like Annie’s and Kathleen’s and Organic Pete’s. It almost feels like shopping in a foreign country’s market. I’ve been focusing on the word “whole” a lot in my prayer life lately. Having been so broken for the last couple of years has made me appreciate the fullness, the vibrancy of Wholeness. I am so thankful to the God that restores my soul and makes me whole again. “16 Rejoice always, 17 pray continually, 18 give thanks in all circumstances; for this is God’s will for you in Christ Jesus. Do you have certain words that speak to your heart? What are they? 1. The span of your smile determines the span of your life. Research backs up the fact that people who smile more often live longer, healthier lives. Smilers have less stress and more positive feedback. I, for one, want to live a long, healthy life and would like to spend that time smiling, how about you? Just think, if you can impress this idea on young people and change their behavior, you can actually make them live longer. 2. Smile + Frown = Smile. Smiles are contagious. If you see someone who is smiling, it is difficult to not smile back. What a great ministry tool it is to know that you possess the power to make sad people feel better just by giving them a smile! In the youth ministry world, this power is valuable for encouraging teens who are feeling down on themselves…and at some point that may be all teens. How can you use this power today? 3. Smiles bring more pleasure than up to 2,000 bars of chocolate. Want to feel good without high caloric intake? Smile. You feel better, the pleasure part of your brain is activated, life is good. I still like chocolate a good bit, but it’s nice to know that I can smile thinking about chocolate without eating it all and still feel good. That’s all today – 3 valuable reasons to smile. I hope this post makes you live longer, happier and healthier.